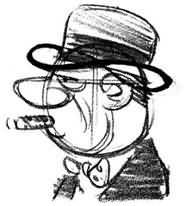 Draw-Cartoons-Today.com - FAQ About How To Draw Cartoons And Cartoon Caricatures Course. Q. Who is Lou Darvas? Q. What will this course teach me? Q. Do you offer a full money-back guarantee? Q. Can I get my copy of the course on CD-ROM? Q. How quickly will I get my guide after ordering? Q. I have more questions. Where can I get assistance? Lou Darvas is one of America's foremost cartoonists. Based in Cleveland, Darvas has produced cartoons for all the national newspapers and many international magazines. He has published many books on cartooning and worked with some of the biggest names in the industry, including George Wolfe, Haff Nelson, Frank O'Neal, and H.M. Talburt. Lou is particularly well-known for his sports cartoons, currently being exhibited in numerous locations throughout the United States. Lou's current financial empire spans millions of dollars. And it's all down to drawing! This course will take you from being an amateur scribbler - and will turn you into a professional cartoonist! It teaches you everything, no matter how good (or bad!) you are right now. Lou will explain the basics... then move on to show you how to put together your own cartoon creations... he explains secret techniques, shortcuts and tricks that only YEARS of experience will teach you. It's like having an industry professional sat with you, explaining EXACTLY what to do and when to do it! This course will teach you how to DRAW CARTOONS... wonderfully. It can also dramatically improve your financial and social status! Certainly. If you aren't happy, you get ALL your money back! After purchasing the course, we ask that you try out the techniques for a period of three months. If you DON'T get your first cartoon PUBLISHED and get your first PAYCHECK within that time period, or you aren't totally satisfied for ANY other reason, just let us know... and we'll refund everything. There are no hidden fees. We want you to be a happy customer! Unfortunately we are no longer offering this course on CD-ROM, but it's great to know that you are interested in a a CD-ROM copy! Shoot us an email once you purchase the program to let us know that you are interested in a physical copy, we will be happy to let you know when we start producing them again. To order the "Draw Cartoons Today!" course CLICK HERE. Note: These prices only valid until midnight, Friday. After your order we'll email you a link to create an account on the Global Writing Network, once you set up your password simply login and view the program contents. It's that easy and you can access the program from any computer or mobile device! Yes. The guide works on every device from anywhere in the world. You'll access the guide from the Global Writing Network member area thru your account. Certainly. We offer up to 50% on every single copy of "Draw Cartoons Today!" sold. Just signup and promote your special affiliate link. We pay you instantly via PayPal, just 35 days after the sale has been completed. Click HERE to learn more. You can contact us at any time through The Global Writing Network. Our friendly team are always happy to help you with any query you may have. We typically answer all queries within just a few short hours, with a maximum response time of one business day. We also provide online chat support during peak periods so you can always be sure of a speedy response. Want to get STARTED with your cartooning career... RIGHT NOW? © Global Writing Network 2019. All rights reserved.